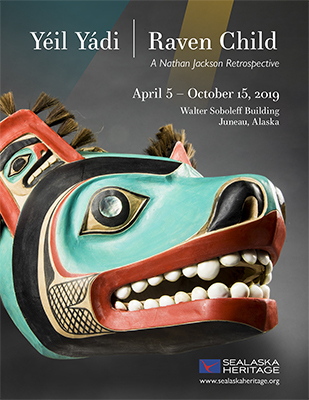 Sealaska Heritage Institute (SHI) will unveil a new exhibit this week featuring the work of Tlingit master artist Nathan Jackson, one of the most renowned and internationally recognized Tlingit artists of his generation. The exhibit, Yéil Yádi—Raven Child: A Nathan Jackson Retrospective, will show Jackson’s work from his earliest productions to his most recent, beginning from the early 1960s and spanning to the present day. “The exhibit allows the viewer to see the evolution of an artist who over decades mastered our ancient art practices and eventually developed his own unique interpretation,” said SHI President Rosita Worl. The exhibit will open at 4:30 pm, Friday, April 5, during First Friday, and will close Oct. 15, 2019. Visitors are welcome to explore it free of charge on Friday. Everyone is welcome. Curated by master carver Steve Brown, the exhibit is segmented into three areas. Early Explorations features pieces from 1962 to about 1966 and includes works produced during his tenure as a student at the Institute of American Indian Arts in Santa Fe, New Mexico. Setting the Bar shows works from about 1967-1972 that illustrate Jackson’s increasing familiarity with the range of Tlingit artistic traditions and the unfolding evolution of his unique personal style. Mature Visions features pieces from the early 1970s onward that illustrate Jackson’s mature and evolved two-dimensional and sculptural styles. Nathan Jackson, Yéil Yádi (Raven Child), practices traditional Tlingit Northwest Coast art as a carver, painter, and designer, creating masks, bentwood bowls, panels, houseposts, totem poles and jewelry. Nathan's artwork can be found in major museums and collections across Alaska, the nation, and the world. He has placed dozens of totem poles in outdoor and interior locations and has major panels on view in public facilities, private businesses and homes. Part of the landscape of Southeast Alaska, his art has accompanied him as an ambassador for his culture, from Ketchikan to London to Kobe. Nathan has made numerous masks and ritual objects for use in clan ceremonies and is celebrated for passing on his knowledge to succeeding generations. In 1988, Nathan received an Honorary Doctorate of Humanities from the University of Alaska, Southeast. In 1995, he was one of 12 recipients of a National Endowment for the Arts Heritage Fellowship Award. In 2009, Nathan was honored as the Rasmuson Foundation’s Distinguished Artist of the Year. He continues to carve large and small projects in the carving shed at the Saxman Totem Park outside of Ketchikan. Caption: Bear Mask by Nathan Jackson. Photo by Brian Wallace for Sealaska Heritage. For a high resolution version of the Bear Mask image, contact kathy.dye@sealaska.com.